Frustrated by annoying callers? Does someone keep calling you endlessly and relentlessly? Here is how to stop them. 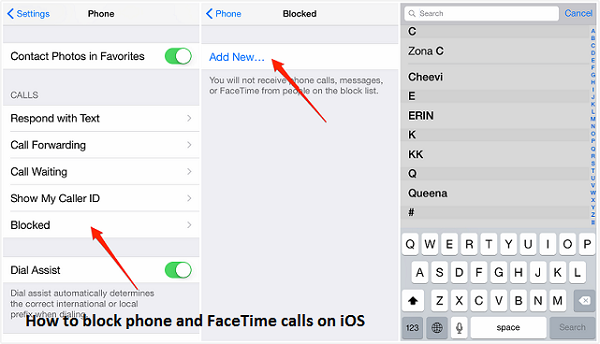 With the FaceTime app, you can block any user anytime. You can block a number with the FaceTime app. Here is how. 1. Locate to your home screen. 2. Open the ‘FaceTime’ app from the home screen. 3. Find the contact you want to block. 4. Tap the ‘Info (i)’ button of the contact you want to block. 5. Tap ‘Block Caller’ at the very bottom of the screen. 6. Tap ‘Block Contact’ on the prompted menu to confirm. That’s it! The contact is blocked, and now he or she is no longer be able to annoy you by FaceTiming. If you’ve an iPhone, then you can use the Phone app of your device to block an address or a number anytime to FaceTiming you. Here is how. 1. Locate to the home screen of your iPhone. 2. Open the ‘Phone app’ from the home screen. 3. Switch to ‘Recent or Contacts’ tab from the bottom menu. 4. Find the contact number or address you want to block. 5. If you’re in the ‘Recent’ tab, then tap the ‘Info (i)’ button of the contact you want to block. 6. If you’re in the ‘Contacts’ tab then tap on the ‘Contact’s name’ you want to block. 7. Tap ‘Block Caller’ at the very bottom of the screen. 8. Tap ‘Block Contact’ on the prompted menu to confirm. 1. Enter into the ‘Settings’ of your iPhone or iPad. 3. Tap ‘Blocked’ near the bottom. 4. Tap ‘Add New…’ at the very bottom of the screen. 5. Tap to select the contact you want to block. 4. Tap on ‘Edit’ button at the top left corner of the screen. 5. Tap the red color ‘(-)’ button of the contact you want to block. 6. Tap ‘Unblock’ at the right bottom corner. 7. And tap ‘Done.’ That’s it! The user is unblocked, and now he or she can call you again.